Simbarashe Sibanda, managing director of the Agriculture to Nutrition (ATONU) initiative and ATONU project leader for the African Chicken Genetic Gains (ACGG) program, was one of the members of the ATONU team which visited poultry production sites in Axum and Debre Zeit, Ethiopia in December 2015. The visit came after several program meetings between ATONU and ACGG last year. We spoke to Sibanda about ATONU’s contribution to ACGG going forward. Simbarashe Sibanda (photo credit: ILRI). How are ATONU and ACGG hoping to work together? Maybe if I backtrack a bit it will put it into context. With ATONU, we are asking the question what can agriculture do to deliver positive nutritional benefits? In some cases we have seen some marked increases in agriculture productivity, in staples especially, yet in the same areas you also find very high malnutrition rates. When you look at the objectives of most agriculture programs they tend to focus on efficiency of production, producing higher quantities and income. With ATONU we are saying that you can go beyond that. We want to ask the question: to what extent is this increased production contributing to nutrition? Smallholder farmers have to depend mostly on what they produce to meet their nutritional needs. 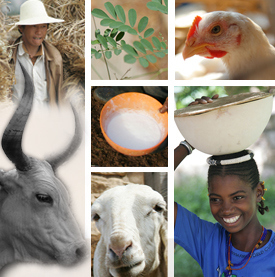 For most rural peoples a variety of nutritional options are not available. We are trying to get agriculture to address these problems. So that’s the motivation for the project. How does ACGG come into this? We do not want to set up new projects, but rather identify existing projects and encourage and support them to include nutrition objectives in the project goals. So the visits that we made in December and the discussions that followed were intended to inform the additional activities that we want encourage in these projects. So with ACGG, we wanted to see the practices that the selected communities are involved in. Do the households pay attention to increasing income? Do they consume what they produce? What would happen if there were increased production? The answers to these questions will structure our interventions. Can you summarise the main findings from the field visits in Ethiopia? It turns out that the emphasis is on income. They are more likely to sell chicken than to eat it. We want to make sure that they eat some of it to improve nutrition. We also want to see if we can influence what they do with their increased income, for example in buying nutrient dense food to supplement their staple. How will you achieve this? Our interventions will range from behaviour change training; engaging with the households and the communities to bringing education on nutrition. The activities chosen will be based on the realities on the ground because we want to implement activities that the farmers can embrace to improve their nutrition. Ultimately, our focus is on women of childbearing age and children under two years. We want to see how ACGG can contribute here. In rural areas chicken is considered a special dish – something for special occasions or the festive season. We also want to ask if there are different ways by which people can prepare and use chicken. So we are looking into the best options for these communities and how it can be superimposed on ACGG’s program design. We will not interfere with the ACGG’s objectives. As well as the environmental differences, is nutrition also culturally sensitive? Have you seen marked differences between the three countries of operation (Ethiopia, Tanzania and Nigeria)? It is, and within each program usually we customize to respond to these differences. We have to ask which interventions will actually work. For example, in a lot of areas of Ethiopia religion plays a big part such as through fasting practices. There are over 200 fasting days/year in Ethiopia. Some people were saying that if production is increased the market may not be active at that time because many people do not consume animal products when they are fasting. On the up side, during the festive times, consumption is much higher than normal. So the farmers adjust around this by producing seasonally. So these are some of the social norms we have to consider. There is also another issue with chickens, that traditionally, it is harder time to breed them in the rainy season because the mortality rate is high at that time. Bigger markets are going to want chickens throughout the year. For example, supermarkets in Addis Ababa will want chicken products throughout the year and therefore require reliable supply. These are practical things that the production system must take into account. How will ATONU and ACGG go forward after these meetings? ACGG is going through piloting and so are we. We are gathering the evidence, using ACGG as the platform. We will eventually add our interventions on the households that ACGG is working with. We will have some controls – in some kebeles it will just be ACGG, and in others we will add the ATONU component so we can see the difference. After this trial period we hope to have enough evidence to scale up. First and foremost ATONU wants to find the evidence for what works. Once we have that we then intend to engage more projects and share those experiences and lessons so that the mainstreaming of nutrition becomes second nature to agriculture development projects, all the way to policymakers. We know that at the policy level there is already high demand for solutions. The African Union has Agenda 2063 where they are promising to create a well-nourished citizenry in the continent. With the Malabo Declaration the African heads of state promised to reduce stunting to 10% by 2025. It is a tall order. How can we reach this practically? We hope that ATONU and ACGG can fill this gap. Learn more about how ACGG and ATONU are working together. Tags: ATONU, Interview, nutrition, Simbarashe Sibanda. Bookmark the permalink.